So far this week I've only managed to make piles on my ironing board. 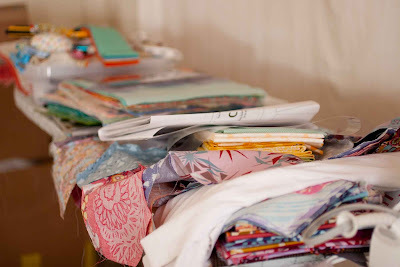 I've got a hexagon pile, a to be mailed pile, a single girl pile, a scraps to be put away pile, and a strips to be sewn pile. So far no sewing for me this week. I can't seem to get off the computer. It's only Wednesday so maybe there is still hope for me. Are you piling or sewing this week? I think you should start a Flickr group called ironing board piles. Then we could really compare who's got the biggest ones. I think I'd be a front-runner. Love the new logo - it looks great! Love the idea of an ironing board piles Flickr group. LOL!!! Some weeks are like that! I never expect to get much done during the week, but do expect to make serious progress on the weekends and that is just not happening to my satisfaction. Off to fight another quilt battle!